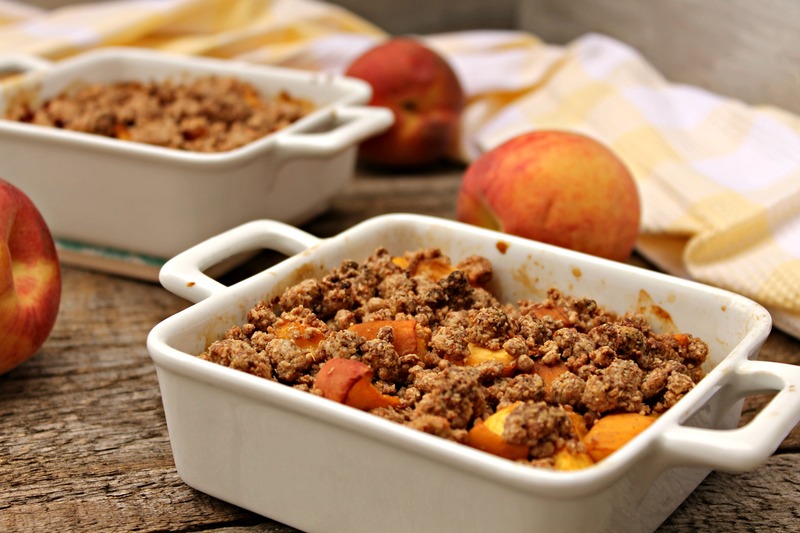 This good wife I am I kept my promise, spent some time in the kitchen this week and came up with a perfectly healthy, yet a little boozy, vegan and gluten-free Peach Crumble that just made us swoon! If you cut the booze – or don’t mind – this is also totally breakfast approve! Don't forget to stir the peaches from time to time whilst baking to make sure the marinade covers all parts of the peach base equally. I always use ground vanilla, it's my favorite. I never used vanilla essence before (simply because it's not common in Germany), so I can't say anything about using it/ measurements. I'd recommend to just try it and trust your taste buds if you want to use vanilla essence. I ate the half of my Crumble warm, directly after taking the pictures and the other half later when it was cold. 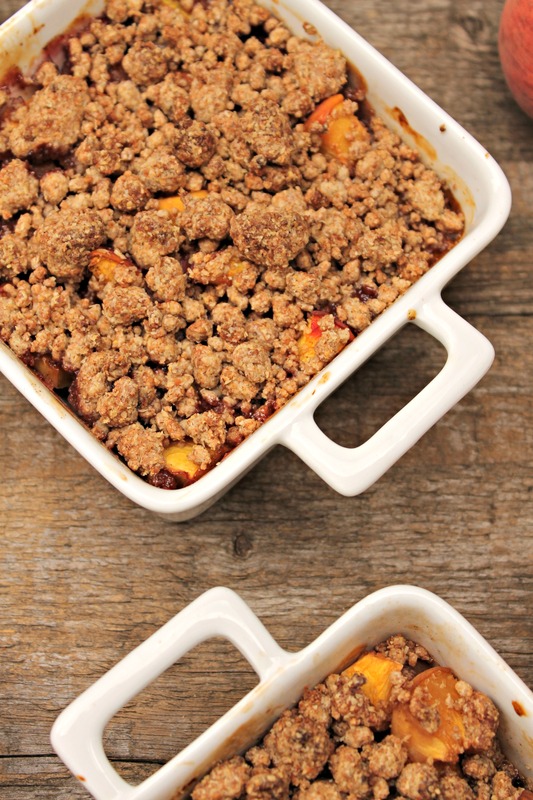 It tasted really good when it had cooled but I would recommend to enjoy the Crumble when still warm. 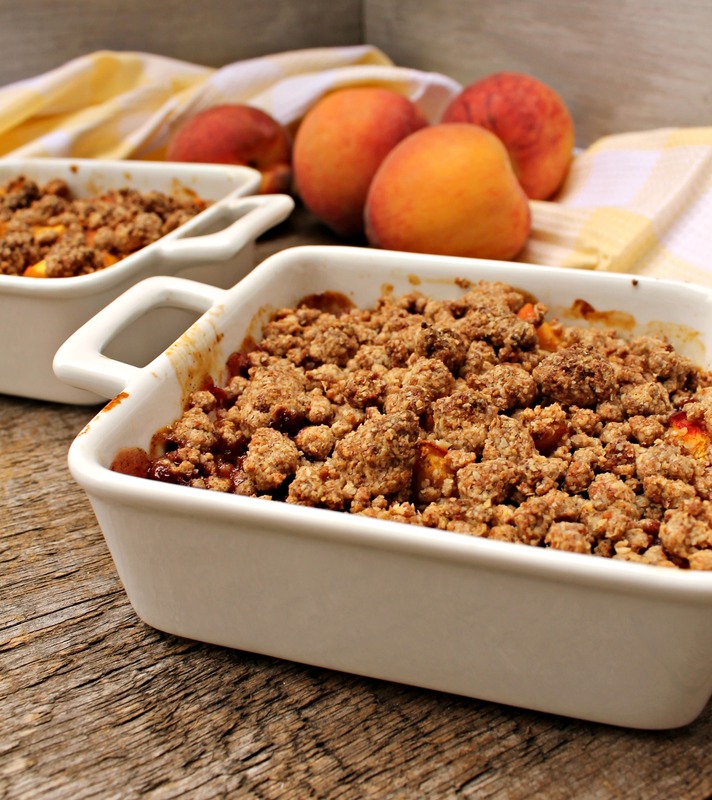 Ahh peach flavored desserts are so perfect for summer weather! Love your special addition to this dish 🙂 I can’t wait to try it out for our next family gathering and cook out! Thank you Jamie 🙂 I’d love your feedback! I love fruit in my desserts. In fact, I like it way better than chocolate. Shh, don’t tell anyone. Shht don’t tell anyone either but I choose a fruity desserts over a chocolaty, too! Haha thanks, that was one of my more genius moments, I guess 😉 Turned out fantastic!